Battle lines are drawn in this round of the Legislature's perennial fight over reproductive health care. Abortion rights groups and Democratic lawmakers are mapping out their strategy as Republicans work on legislation to further restrict the procedure in Texas. For abortion rights advocates, that strategizing took the form of a Wednesday news conference at the Capitol by a campaign calling itself "Trust. Respect. Access." 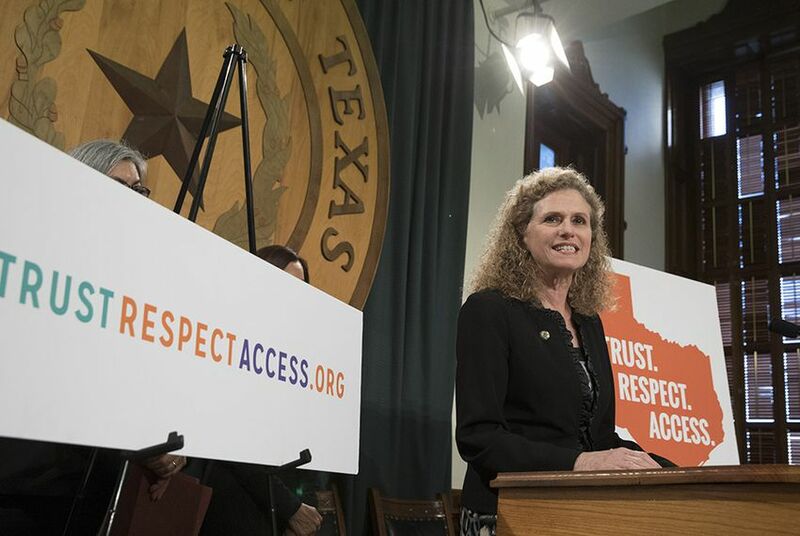 The group, made up of 12 organizations working to “promote trust in Texans to make their own reproductive health care decisions, respect for the judgment of medical professionals and access to abortion,” is one of several that have sprung up as Republicans at the state and federal level work on potential legislation targeting abortion. Legislation requiring abortion providers to file fetal death certificates after the procedure. Bills requiring the burial of fetal remains, banning already limited insurance coverage for abortions and outlawing what opponents call "dismemberment abortions" — second-trimester procedures that require surgical instruments to grasp and remove pieces of fetal tissue. "Protecting the life of unborn children should not be a controversial issue," said state Sen. Charles Perry, R-Lubbock, who authored that final measure. Abortion rights advocates in the Legislature are also rattled at the national level — by talk from President Donald Trump and members of the Republican-controlled Congress about ending federal funding for Planned Parenthood and overturning the U.S. Supreme Court’s decision on Roe v. Wade. Reverse the 24-hour waiting period to get an abortion. Remove information in a state-authored Woman’s Right to Know booklet that falsely alleges that abortions increase risk of breast cancer. Cover prescription contraceptives for children younger than 18 under the Children’s Health Insurance Program. Farrar, chairwoman of the House Women's Health Caucus, said at the Wednesday rally that the Legislature "should champion policies that support the needs of women, their families and their children. ... That’s why I continue to fight for policies that positively impact Texas families." She said “people are waking up and they’re showing up” on reproductive health and women's rights issues, pointing to some successes in the 2015 legislative session that improved conditions for nursing moms and gave more women access to certain long-acting forms of contraception. Howard said the state’s high rates of unplanned pregnancies and teen births provide an opportunity for legislators to take a bipartisan approach to contraception. “There are a lot of colleagues that maybe you wouldn’t typically think would be with us on some of these things, but they recognize the benefits of this and recognize the cost savings to the state as well," she said. But Emily Horne, senior legislative associate for the anti-abortion group Texas Right to Life, said such legislation would be more likely to pass if the Democrats backing them dropped abortion-related provisions. Case in point? How Republican lawmakers endorsed and passed Howard’s amendment to the House rules this year to make it easier to breastfeed in the Capitol. “So many of these are ideas that could have widespread support if they were separated from a push for abortion,” Horne said. "There is a zero percent chance of success for pro-abortion legislation filed by Democrat lawmakers this session," he said. After three days of testimony from attorneys for the state and Planned Parenthood, U.S. District Judge Sam Sparks is letting the reproductive health provider stay in Medicaid until Feb. 21.